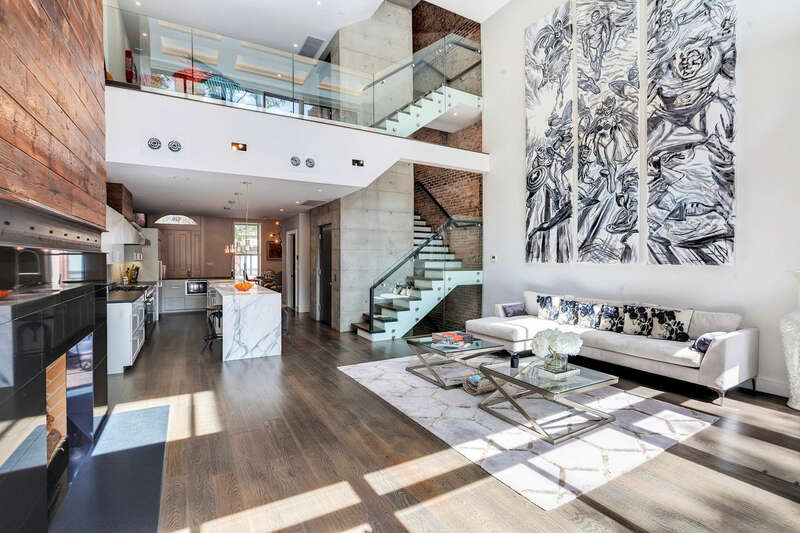 The luxurious interior boasts just over 7 000 square feet of living space with five bedrooms, five full and three half baths thoughtfully arranged on six floors. This rare townhouse has been lovingly rebuilt from the inside out by a highly respected home builder and boasts structural detail and impeccable appointments that will delight at every turn. More than 1 750 square feet of prized outdoor space includes a private garden, two private terraces and a landscaped roof deck that is steel enforced, affording the option of installing a Jacuzzi. The home's authentic facade including the exterior front stoop has been fully restored to its original 1910 splendor, which blends perfectly into the fabric of the historical Midtown West, and more specifically, Hell's Kitchen neighbourhood. New triple-pane windows, a mahogany door, trim and moldings were artfully restored. Through great effort a modernized layout was achieved by perfecting the floor plan is to ensure an open modern layout and seamless flow for entertaining. Upon entering the foyer, a direct view through the 50 foot deep townhouse to the 1 750 square foot balcony and garden is immediately observed. To the left of the entrance sits a perfect space for hosting large dinner parties. Proceeding to the rear of the main level is the gourmet kitchen and then a double-height living room with 22 foot elevated ceilings and a dramatic 22 by 25 foot wall of glass windows. The western wall of the main floor is graced by an architecturally inspiring wood-burning fireplace enveloped by the original 100 year old floor joist, meticulously restored to blend with the home's now modern vibe. Below the main level full-floor entertainment space guaranteed not to disappoint. The garden level is designed to entertain groups large and small and is outfitted with a pinball machine, pool table, four televisions and 85" 4K TV with surround sound. The bar and kitchen are equipped with Viking appliances, a beer tap, soda gun and LED lighting to set the mood. Access via the rear entry boasts a blue stone paved garden furnished with an available gazebo and wall-to-wall sliding glass door entryway. Floating steps enveloping a state-of-the art elevator lead to the Mezzanine which boasts one of the best focal points in the home. Gaze over the double-height living room and up through the generous voluminous coffered ceilings with inset LED lighting. This space makes a perfect informal sitting area, library or home office. The third and fourth stories are comprised of four equally laid-out bedrooms with en suite bathrooms. The first suite shares the second level with the mezzanine and two additional suites are separated by the subway-tiled laundry room. Each of the four en suite spa baths feature a luxurious five piece shower component system with a rain shower faucet that are powered by a commercial-grade Sico water pressure booster. The fourth floor houses the last of the suites as well as the first level of a one-of-a-kind two story master bedroom suite with a spiral staircase leading you to the office space and front-facing grand terrace. The blissful master suite is both an engineering and design masterpiece, the sumptuous south-facing master suite that cantilevers the main structure an incredible eight feet is the ultimate oasis. The duplex retreat is surrounded by 22 foot windows and the luxurious master bath boasts Prima Callacatta marble, radiant heat floors, an oversize Jacuzzi tub, a multi-head shower room with seating and Japanese bidet and commode. The capacious, thoughtfully designed walk-in closet/ dressing room provides generous space for every last bit of your clothing, accessories and leather goods.